The 8th edition of Reverberates is here, which means the hugely popular, or at the risk of saying, the most popular Film Quiz on Malayalam cinema is back. The Chitramela Film Quiz, conducted by Rajesh Mohanan at the Malabar Christian College, organised by Quiz Kerala Pictures, in association with the Quiz Society of India ended up being one of the biggest and the most popular quiz shows ever based on Malayalam cinema history, going by the buzz in the social media circles. 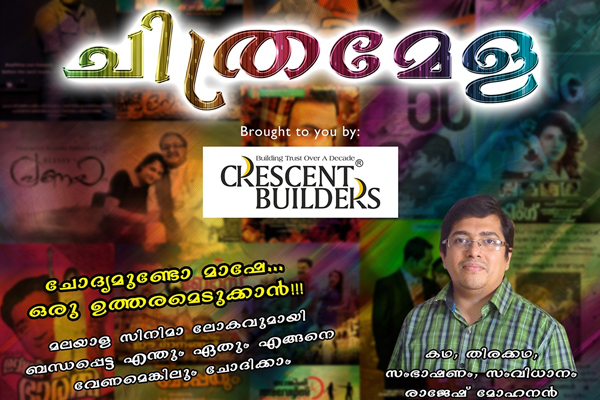 A Quiz on those movies made inside the Malayalam movies we watched through the years. Continue reading A Quiz on those movies made inside the Malayalam movies we watched through the years. If you think you know your GK Pillai from Kollam GK Pillai, and happen to be in Kozhikode on June 2nd, you better be at the Malabar Christian College. Quiz Kerala Pictures, in association with the Quiz Society of India is hosting the biggest quiz show based on Malayalam cinema history at the college premises. For those of who are a part of the vibrant informal music discussion group of MSI, this would be a no-brainer and a little ‘musty’, but I guess it still holds an element of relevance and importance to those who love the history of Malayalam Cinema. Starting tomorrow, Old Malayalam Cinema would be regularly featuring Anil’s Malayalam Movies Quiz, a Single Question Affair – short and sweet, from Malayalam film history, guaranteed to put your grey cells on overdrive. Another set in the “How well do you know Malayalam Cinema ?” Series, this time from a Maestro whose knowledge on Malayalam Cinema and Music is legendary – Sri Raja Gopal. Before you start off, I would just like to remind you on the ONLY CONDITION that governs the quizzes here – Be Honest to Yourself. Please keep Google out of this.